Ultimate Star Jennylyn Mercado reflects on her earlier hit singles, the cover of the well-loved ballad "If I'm Not In Love" which she revived with King Of Soul Janno Gibbs on her first studio album 'Living The Dream' back in 2004. Jennylyn takes us back to memory lane as she belts out one of her signature songs once again this time with her bessie Nar Cabico. This is definitely worth watching! 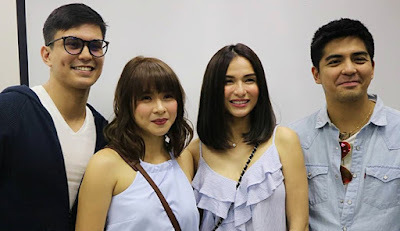 Kapuso Leading Man Tom Rodriguez is thrilled to be paired with Ultimate Star Jennylyn Mercado for the upcoming Kapuso prime time series 'The Cure'. Tom described Jennylyn as an amazing actress and also revealed that he is a fan of hers. Meanwhile, Jennylyn recalled her first project with Tom which was for a Lenten Special a few years ago entitled 'Pagsubok'. 'The Cure' marks Tom and Jennylyn's first prime time series together. Watch out for 'The Cure' soon on GMA Telebabad. Watch their interview below with GMA News' 24 Oras. 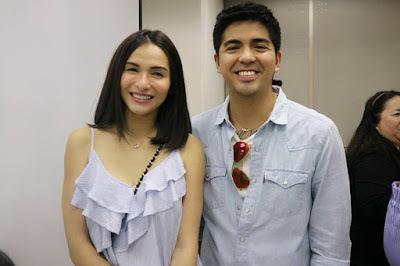 It has been 15 years since Jennylyn Mercado and Mark Herras won the first season of the phenomenal reality-based artista search 'Starstruck' but the memories of it are still fresh as if it only happened yesterday. Fast forward to 2018, Jennylyn and Mark are once again reuniting on a project together via GMA Network's newest upcoming prime time offering 'The Cure'. Their respective roles have yet to be announced however reports say that it is Tom Rodriguez who will play Jennylyn's leading man in the said series. Watch out for 'The Cure' this 2018 on GMA Telebabad! Meet the powerhouse cast of GMA Network's newest prime time offering 'The Cure' lead by Ultimate Star Jennylyn Mercado and Kapuso Leading Man Tom Rodiguez. Joining Jennylyn and Tom on 'The Cure' are LJ Reyes, Mark Herras, Ken Chan, Arra San Agustin, and Ms. Jacklyn Jose. Directed by Mark Reyes. Watch out for this Kapuso soon on GMA Telebabad. Ultimate Star Jennylyn Mercado is making a comeback on GMA Telebabad after her iconic portrayal of the role of Steffi Chavez in the Philippine adaptation of 'My Love From The Star.' 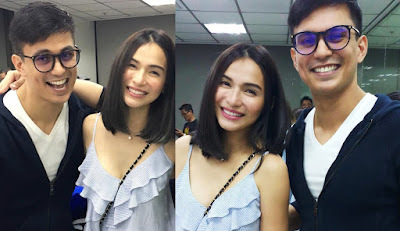 This time, Jennylyn is teaming up with Kapuso leading man Tom Rodriguez in the new prime time series entitled 'The Cure' under the helm of Direk Mark Reyes. 'The Cure' is Mercado and Rodriguez' first soap together. WATCH: Jennylyn Mercado and Dennis Trillo try out Bohol's "Chichaworm"
Jennylyn Mercado and Dennis Trillo's trip to Bohol just got more exciting as they try out the province's well-known exotic crispy snack, "Chichaworms." The Ultimate Star was able to capture that moment and she shared it to her followers via Instagram stories. Watch the clip below. They say love is meant to be an adventure. We bet Jennylyn and Dennis will never forget this moment. Kapuso couple Jennylyn Mercado and Dennis Trillo once again won the hearts of netizens as they share sweet photos from their recent vacation. Check out the photos of below. This shot of Jennylyn and Dennis is just adorable! Even Kapamilya actress Angel Locsin felt the kilig as she leaves a heart emoji on this post by fellow Avon endorser Jennylyn Mercado. Jennylyn is surely at her happiest. Dennis Trillo and Jennylyn Mercado's new year is off to a sweet start! What could be more romantic than to be in the arms of your loved one by the beach with a beautiful sunset as your backdrop? Here's a photo of the Kapuso lovebirds shared by Dennis himself on his Instagram page. "Forever" seems to be very clear in this photo! Agree? Watch the 'All Of You' cast's carpool bonding as they talk about their movie, the happenings behind the scenes, their views about love and many more. Join the 'All Of You' lovekada with Derek Ramsay, Jennylyn Mercado, Yayo Aguila, Milo Elmido Jr., and Darren Espanto as they take you to a fun and kilig ride. Catch 'All Of You' in cinemas nationwide. Now on its second week! In a recent interview, 'All Of You' lead star Derek Ramsay names his leading lady Jennylyn Mercado as one of his Top 3 Sexiest Women in the World. In can be recalled that Jennylyn was named No. 1 Sexiest Woman by a men's magazine back in 2015.
Who agrees with Derek? Catch Jennylyn and Derek in the romantic drama 'All Of You', an official entry to the 2017 Metro Manila Film Festival. Now on its Second Week!